Inside plant refers to the cabling running inside a building. Similarly, outside plant is the cabling running outdoors. Outside plant cables are thicker because of more durable insulation jackets. As for fiber optic communication, there are many types of outside plant fiber optic cables. Some have extra protections to prevent corrosion and other elemental interference. Outside plant fiber optics are widely used in telephone networks, CATV, metropolitan networks, utilities and so on. If you want to choose the right outside plant fiber optic cable, its applicable environment is an important factor for consideration. This post will introduce some common outside plant fiber optic cables and typical outdoor application environments. Outdoor breakout cable is perfect for rugged applications and installations that require increased performance. It is usually made of several bundled simplex cables wrapped in a common cable jacket. The fungus, water and UV protections and temperature durability are beneficial to its outside applications. 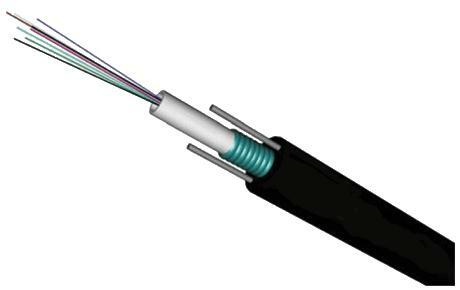 Its design of individual fiber reinforcement enables the quick termination to connectors and omits the use of patch panels or boxes. With much less termination work, outdoor breakout cable is more cost-effective when small fiber counts and short distances are required. Outdoor loose tube cable has the gel-filled design protecting the cable from moisture environment. The gel within the loose-tube construction stops the penetration of water and keeps it away from the fiber. Also, it keeps water from freezing near the fiber at low temperatures which reduces the chance of stress fractures. Fibers are bundled inside a small plastic tube that can protect fibers from outside stresses. Outdoor loose tube cable is often used in conduits, strung overhead or buried directly into the ground. Outdoor ribbon fiber optic cable has high fiber counts and small cable diameter. It contains the most fibers in the smallest cable. These fibers are laid out in rows as ribbons, and ribbons are laid on top of each other. Likewise, it also has gel-filled protection to block outside water. Ribbon cable makes installation much faster and easier since mass fusion splicers can join a ribbon at once. Outdoor armored cable is a direct buried type that prevents itself from animal bite. The metal armoring between two jackets effectively prohibits rodent penetration. Outdoor armored cable can be divided into light armored and heavy armored types. The former has the protective plastic jacket with the same durability and longevity of a stainless steel cable with a lighter weight. The latter is wrapped in a wire circle to be applied for underwater regions that near shores and shoals. Outside cable plant deployment can be implemented in many environments. Above-ground, underground, buried and underwater are the typical applications. Above-ground cable plant can be exposed to extreme temperatures, and to humidity that varies with the seasons and with daily temperature changes. Cables under such circumstances should be durable to adapt to extreme weathers and water penetration. Underground cable plant usually applies cables in underground structures including the utility holes, controlled environmental vaults, ducts and so on. The condition in utility holes and ducts sometimes can be corrosive because of man-made chemicals. Cables with corrosion-proof materials are perfect for this environment. Buried cable plant applies cables directly into the soil. Cables can also be exposed to the same corrosive environment as underground plant. But animal bite is an additional problem. Cables for this application should be very tough to endure both chemical corrosion and animal attack. Underwater cable plant are located beneath the surface of water. The water can range from relatively pure to brackish, or to badly contaminated with industrial effluent. Cables for underwater plant are extremely rugged, with fibers in the middle of the cable inside stainless steel tubes and the outside coated with many layers of steel strength members and conductors for powering repeaters. Unlike indoor cables, outside plant fiber optic cables must be wrapped in different layers to withstand the severe installation conditions. Choosing the right kind of outdoor cable can save you a great deal for long-term maintenance. And your project application is an important aspect that will affect the selection of fiber optic cables. You may familiar with bulk fiber optic cable, but how much do you know the differences between tight buffer fiber and loose tube cable? This article will focus on tight buffer vs loose tube cable. 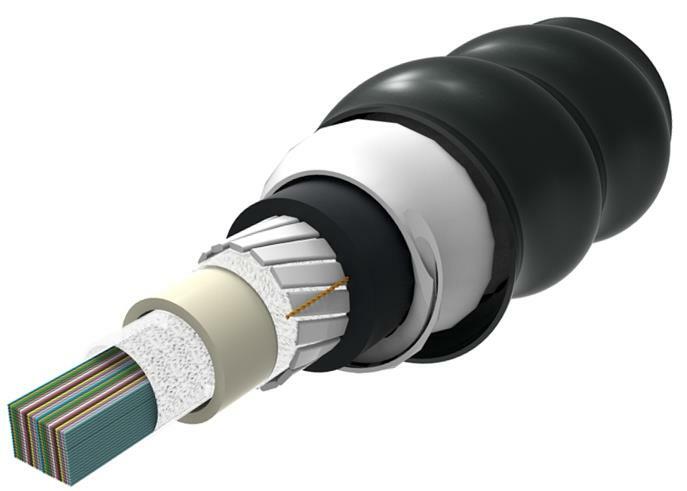 Tight buffer or tight tube cable designs are typically used for ISP applications. Each fiber is coated with a buffer coating, usually with an outside diameter of 900m. Loose buffer or loose tube cables mean that the fibers are placed loosely within a plastic tube whose inner diameter considerably larger than the fiber itself. Usually 6 to 12 fibers are placed within a single tube. The interior of the plastic tube is usually filled with a gel material that protects the fibers from moisture and physical stresses that may be experienced by the overall cable. Loose buffer designs are used for OSP applications such as underground installations, lashed or self-supporting aerial installations, and other OSP applications. Each construction has inherent advantages. The loose buffer tube offers lower cable attenuation from microbending in any given fiber, plus a high level of isolation from external forces. Under continuous mechanical stress, the loose tube permits more stable transmission characteristics. 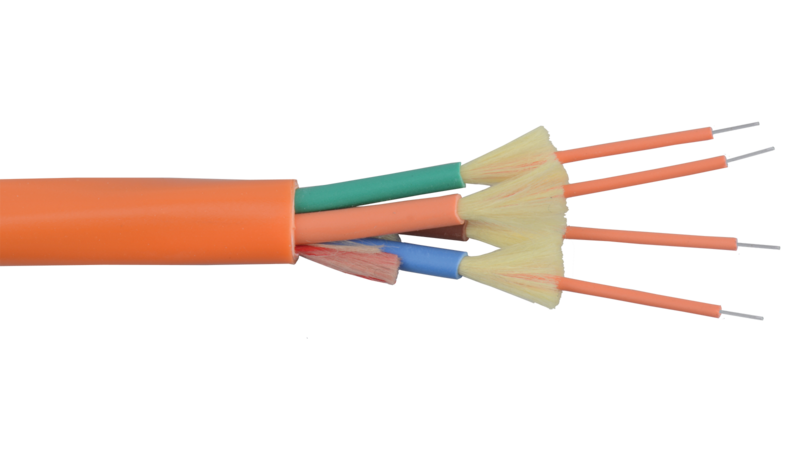 The tight buffer construction permits smaller, lighter weight designs for similar fiber configuration, and generally yields a more flexible, crush resistant cable. The other fiber protection technique, tight buffer, uses a direct extrusion of plastic over the basic fiber coating. Tight buffer constructions are able to withstand much greater crush and impact forces without fiber breakage. The tight buffer design, however, results in lower isolation for the fiber from the stresses of temperature variation. While relatively more flexible than loose buffer, if the tight buffer is deployed with sharp bends or twists, optical losses are likely to exceed nominal specifications due to microbending. Cable tensile load ratings, also called cable pulling tensions or pulling forces, are specified under short-term and long-term conditions. The short-term condition represents a cable during installation and it is not recommended that this tension is exceeded. The long-term condition represents an installed cable subjected to a permanent load for the life of the cable. Typical loose-tube cable designs have a short-term (during installation) tensile rating of 600 pounds (2700 N) and a long-term (post installation) tensile rating of 200 pounds (890 N). Tight buffer vs loose tube cable, each has its own advantages and uses. Nowadays there are many big brands fiber optic cable manufacturers provide tight buffer cables and loose tube cables. FS.COM, also offers a wide range of bulk fiber optic cables, including cables from corning and cables for different applications, bulk fiber optic cable can be made in a variety of lengths and configurations to meet your needs. For more details, please visit FS.COM. 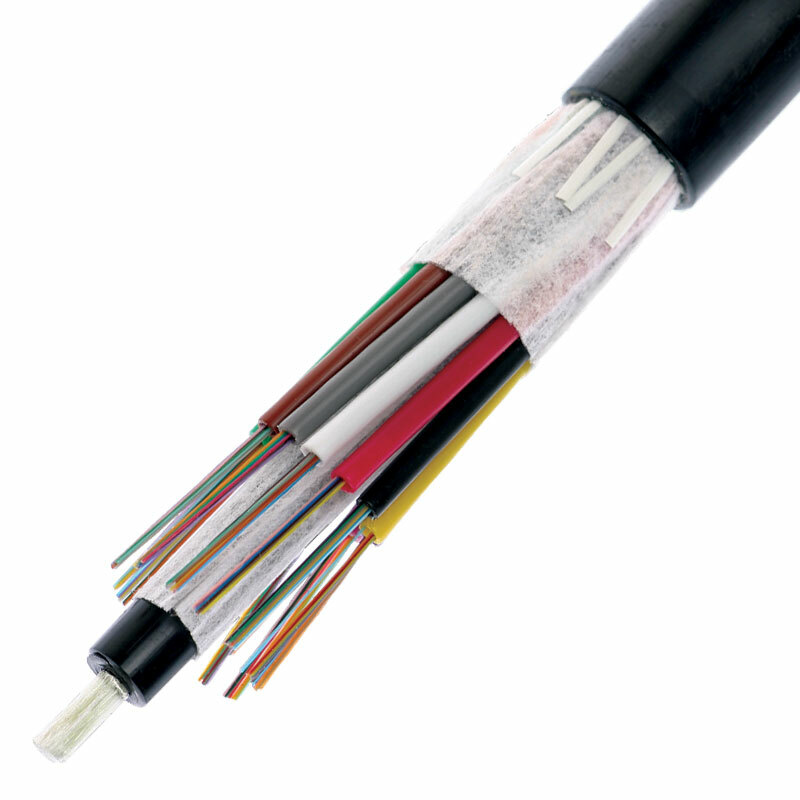 Which Tight Buffered Fiber Distribution Cable Fits Your Application? Bulk fiber optic cables are widely used in modern, gradually replace of copper cables. FDDI or Fiber Distributed Data Interface (Token Ring). Depending on the number of fibers and how and where it will be installed, bulk fiber optic cables come in lots of different types. Choose cable carefully as the choice will affect how easy it is to install, splice or terminate and, most important, what it will cost! Such as tight buffered fiber cable and loose tube cable. Loose tube cable majority used in outside-plant installations, while tight-buffered cable primarily used inside buildings. Tight buffered (coated with a 900 micron buffer over the primary buffer coating) with Kevlar (aramid fiber) strength members and jacketed for indoor use. The jacket is usually 3mm (1/8 in.) diameter. Zipcord is simply two of these joined with a thin web. It’s used mostly for patch cord and backplane applications. Single-mode tight-buffered cables are used as pigtails, patch cords or jumpers to terminate loose-tube cables directly into opto-electronic transmitters, receivers and other active and passive components. Multimode tight-buffered cables also are available and are used primarily for alternative routing and handling flexibility and ease within buildings. Distribution Cables contain several tight-buffered fibers bundled under the same jacket with Kevlar strength members and sometimes fiberglass rod reinforcement to stiffen the cable and prevent kinking. These cables are small in size, and used for short, dry conduit runs, riser and plenum applications. The fibers are double buffered and can be directly terminated, but because their fibers are not individually reinforced, these cables need to be broken out with a “breakout box” or terminated inside a patch panel or junction box. They can be multimode distribution indoor cable, single mode plenum distribution indoor cable, multimode plenum distribution indoor cable, waterproof cables, etc. In a loose-tube cable design, color-coded plastic buffer tubes house and protect optical fibers. A gel filling compound impedes water penetration. 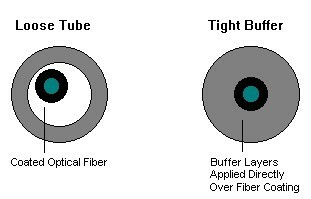 Excess fiber length (relative to buffer tube length) insulates fibers from stresses of installation and environmental loading. Buffer tubes are stranded around a dielectric or steel central member, which serves as an anti-buckling element. The cable core, typically surrounded by aramid yarn, is the primary tensile strength member. The outer polyethylene jacket is extruded over the core. If armoring is required, a corrugated steel tape is formed around a single jacketed cable with an additional jacket extruded over the armor. FiberStore covers a wide production line of bulk fiber optic cable, from common bare fiber, waterproof cables to special fiber cables for specific applications. Flexible or rigid cables of copper or aluminium, with a complete range of polymers and protectors, always developed under the most stringent international standards.